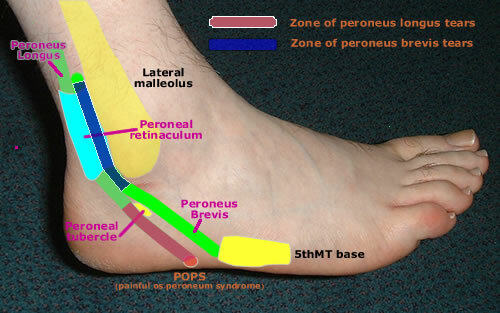 Patients with peroneal tendon problems usually present with pain, swelling and sometimes clicking or popping on the posteromedial aspect of the ankle or the lateral aspect of the hindfoot. Those with longus tears may localise the pain to the entry to the cuboid tunnel (POPS) or occasionally under the midfoot. There may be a history of an ankle “sprain”, especially with brevis tears. There may be varying amounts of synovial swelling. Pes cavus may be associated with a longus tear - it's important to recognise this because it may be necessary to consider realigning the foot in association with tendon reconstruction. Feel for tenderness over the tendon – typically behind the malleolus with brevis tears and at the entry to the cuboid tunnel or at the IPR with longus tears. Getting the patient to actively rotate the foot, especially into resisted dorsiflxion - eversion, may produce obvious tendon prolapse onto the lateral aspect of the malleolus. With lesser degrees of instability there may be no obvious prolapse but the brevis tendon may be felt to slide laterally, usually in eversion. A brevis tendon which becomes prominent laterally often has a longitudinal tear. Resisted contraction of each tendon may reproduce the patient’s pain. Active movement may produce a grating or creaking sensation over the tendons.